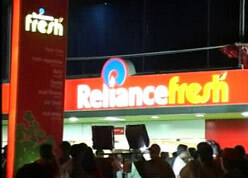 Reliance Industries Ltd promoted, Reliance Fresh, opened for consumer business in Hyderabad just a while ago. Our blogger reports that their was significant presence of crowd in the stores across Hyderabad. The mush awaited pricing has been revealed and we don’t find much difference between local retailer and Reliance Fresh. In some items, we did see that Reliance sold at 15% less to other retailers. Current market leader Pantaloon Retail India Ltd has said they will respond to any pricing war Reliance will initiate. Reliance Fresh has started loyalty program on day one and you get 1 point for every Rs100 you spend in any of the Reliance Retail stores and you encash the same in any of Reliance Retail stores be it be Reliance Fresh or Reliance Hypermarket. However, Reliance Industries Ltd may have lost the battle and right to use Reliance Credit Card as Anil Ambani promoted Reliance Capital Ltd has already unveiled it.